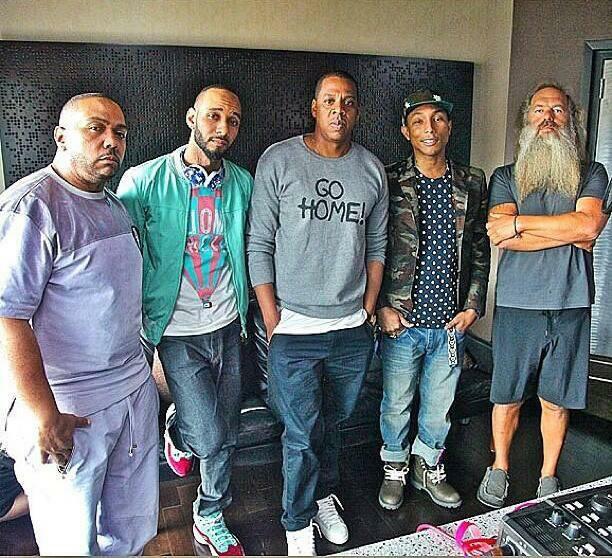 Timbaland, Swizz Beatz, Jay-Z, Pharrell Williams, and OG Rick Rubin. Oh, that Go Home! sweatshirt Jay-Z is rockin’? As @Jose3030 points out, you can get yours here for a cool $170. With all the Kanye Yeezus buzz on the interwebs last week, anyone else get the feeling Jay-Z is everything Kanye wishes he could be? Feels like Jay is always one step ahead of him… and a few steps better than him, no? A non-musical case in point? Beyonce > Kim Kardashian. This entry was posted in Music, NBA, News and tagged Jay-Z, Jay-Z's "Magna Carta Holy Grail", Magna Carta Holy Grail, OG Rick Rubin, Pharrell Williams, Swizz Beatz, Timbaland. Bookmark the permalink.